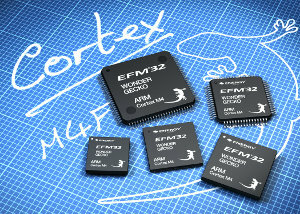 Energy Micro has just announced the EFM32 Wonder Gecko series with the addition of 60 ARM Cortex-M4F based MCU to its Gecko offering or a total of 240 MCUs. The new controllers are highly energy efficient and minimize energy consumption by including a flexible range of standby and sleep modes, intelligent peripherals that allow designers to implement many functions without CPU wake-up, and ultra-low standby current. Wonder Gecko MCUs come with 256KB Flash memory and 32KB RAM and can achieve active mode current consumption of just 180µA/MHz. Devices provide a deep sleep mode that consumes just 400nA with RTC running, a shut-off mode requiring only 20nA and wake-up time as short as 2µs. The company explains that the LESENSE function block, a generic low energy sensor interface, enables monitoring of a mix of up to 16 capacitive, inductive or resistive sensors while the MCU core is in sleep or shut-off mode. In the video below, Andreas Koller, Vice President of Worlwide Sales and Marketing of Energy Micro, introduces the new Wonder Gecko micro-controllers, explaining those are pin-to-pin compatible with existing energy Micro EFM32 Gecko MCUs and are ideal for applications requiring very low power consumption such as security and safety systems, medical and lifestyle products, smart meters and intelligent sensors. The Wonder Gecko processors will be available in sample quantities in Q3 2012, with pricing starting at 2.64 USD for 100K orders.